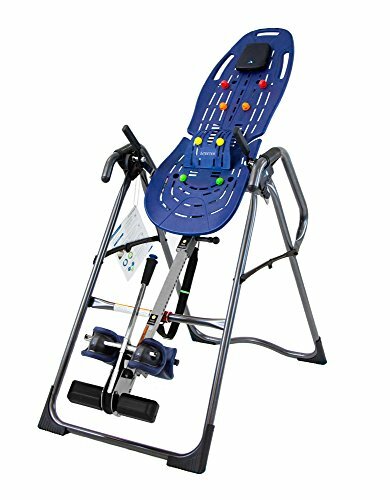 Inversion table exercising instrument is based on the inversion therapy concept. Inversion therapy involves being upside down or at an inverted angle while hanging by the legs, ankles or feet with the intention of therapeutic benefits. The process of doing so is referred as inversion. It is a form of spinal decompression that is the surgical procedure intended to relieve pressure on the spinal cord. It is also a form of spinal traction that is a mechanism for straightening broken bones or relieving pressure on the spine. Inversion table are used as a treatment primarily for back pain. They are designed to utilize gravity and create some traction in the spine and pelvis. Based on the concept of inversion therapy that is laying at a downward angle, not hanging completely upside down. The effectiveness of using inversion table for back pain is not well studied, but many people do experience short term relief after undergoing this inversion therapy. It is important to note that inversion table is not an alternative to the treatment offered by your family doctor, orthopedist or physiotherapist. Some health professionals recommend inversion table along with the medicated treatment. Many doctors may even have inversion tables available at their clinic. But is also concluded that inversion table do not cure any disease or condition for a long term. So this is just a short term treatment to help to reduce the back pain. If any person is inverted more that few minutes then it may increase blood pressure especially within your head and eyeballs. In such cases people with eye diseases, high blood pressure or those with a history of migraines or stroke are advisable to be very cautious with the use of inversion table. Before using the inversion table placing it at right place in your home is very important. Make sure to keep the table in free space so that while inverting you don’t bang your head on anything or cause any injury. It is always recommended to keep the inversion table on a mat or rug so it won’t get unstable. Inversion tables are height adjustable to get the maximum effect or result. There is also a measurement rod available to adjust the table as per your height. It is always recommended to read the manual carefully before purchasing the inversion table. As, the inversion table is not suitable for extreme tall or extreme short people. If you are the first time user of the inversion table then it is always recommended that you start with the lowest inclination. It means your head should at lower height that of your legs. This is a precaution measure as if you suddenly take upright position that may result into dizziness, headache or sudden blood flow to your head that may be hazardous. Make sure that you have wrapped the safety strap properly before heading to any inclination. Increase the frequency and duration of your inversion session gradually. Once you are comfortable with one position then go for the next or forward inclination and hence gradually you will be able to achieve the inversion of body. Consult your family doctor or physiotherapist before practicing the inversion position therapy. You should not use the inversion table if you have followed conditions – pregnant, hernia, recent stroke or heart attack, unhealed fracture, spinal cord injury, sever obesity etc. These are some conditions in which one should avoid using the inversion therapy. Now we have seen that inversion table is best benefit in case of backache so do not bear that pain anymore. Teeter inversion table is designed to help people like you to overcome with their backache problem. Teeter inversion table is a gentle and passive way to target the pain. The teeter inversion table creates an ideal stretch that improves spinal health and pain relief. It rehydrates discs, reduce nerve pressure, realign the spine and relax tense muscles. The teeter inversion table not only helps to improve spinal health but also ease stress, improve joint health, increase flexibility, improve fitness. Overall, spending few minutes on teeter inversion table makes you feel rejuvenated and fit. Now overall you have understood that how inversion table teeter is helpful to you. We have shortlisted some of the best teeter inversion tables in the market that will help you while shopping for your inversion table. Teeter is the only FDA cleared inversion table indicated for back pain, muscle tension and spasm. Its comfort and support is unmatched and cannot be compared with any other inversion table. The patented wrap around the ankle cups are made from special foam. It comes with a contoured bed with hand grips flexes for comfort and optimizes stretch for maximum relief. It has precise rotation for total control. It can shift your body weight by simple arm movement for easy return to the upright position. It is the best durable model in inversion table as it is made of high grade materials for reliability and durability. It is made from heavy gauge steel parts with patented security features like auto locking hinges, cam locks and specialized pivot bearings for durability. 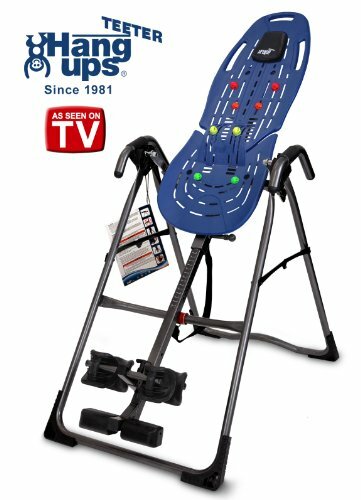 This all new Teeter inversion table comes with X1 premium features. X1 feature means acupressure nodes provide trigger point release while lumber bridge supports traction on the lower back. Its unmatched comfort and support makes it more comfortable in use. It comes with Flex Tech bed with 8-point floating suspension system moves with you for greater range of motion and allows for maximum body slide for better decompression. It has best grip and stretch handholds in the bed and frame for added stretching options that gives you satisfying result after use. It has patented wrap around ankle cups for comfortable ergonomic fit. It comes with a precise rotation for total control. It is easy to do simple arm movements to shift your body weight so you can effortlessly invert and return to the upright position. It can be easily adjusted to any angle with optional lock-out in full inversion. It has heavy gauge steel parts with patented features. The Contour L5 Inversion Table A is a modern twist on classic design. It is beautiful, sleek. It provides unparalleled user-friendliness and security. The ergonomic Flex-Technology bed and Deluxe EZ-Reach ankle system enhances your experience to achieve the ultimate in joint and back pain relief. Just few minutes a day on Teeter can help you gain the naturally stretched back and spine to help relieve back pain. Its use improves joint health and increases flexibility, plus builds and tone muscles with inverted exercise. The precise balance in the teeter inversion table when compared with other engineering designs shows that teeter is the best designed equipment in inversion therapy with the most precise balance. The superior design allows controlled oscillation with minimal effort promoting fluid movement in the joints. It comes with premium features like extended ankle lock handle for easy securing. It has traction handles and extra long stretch and Max handle for maximum stretching. It also has easy handle tether with preset markings at 20, 40 and 60 degrees. Its unmatched support and comfort is incomparable. It has patented wrap around ankle cups for ergonomic fit. The premium contoured Bed flexes for comfort and optimizes stretch for maximum relief. It’s easy to do due its precise rotational movement flexibility. Simple arm movements shift your body weight so you can effortlessly invert and return to the upright position. It’s durable and reliable due its high grade material construction. The EP-970 elevated the user experience with features and accessories designed for enhanced comfort and ease of use. Its Deluxe EZ-Reach ankle system reliefs back pain. Acupressure Nodes and Lumbar Bridge are included in this model so you can modify your stretch by adding healing pressure and increased decompression. This teeter inversion model also has EZ-Stretch Traction Handles that add stretching and decompression options. Its large Stretch Max Handles provide support and assistance, and the EZ-Angle Tether marks preset angles of inversion at 20, 40, and 60 degrees. It is smooth, durable and easy to clean. It is enriched with unique and patented features like auto locking hinges, cam locks; specialized pivot bearing and heat treated steel parts. So above are the some highly rated Teeter Inversion tables that you may consider to buy. 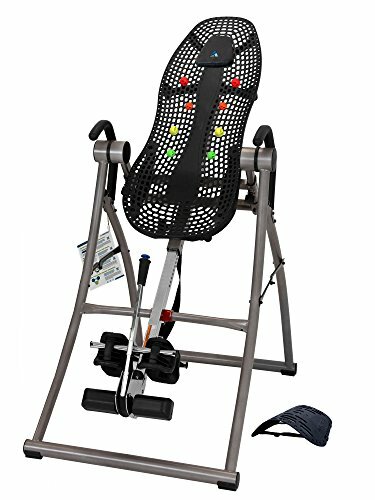 When you buy an inversion table Teeter inversion table is the best brand to go for as it is the only brand that is FDA approved and are most durable and enriched with all the necessary security features. Body fitness is very important and if inversion therapy is recommended to you by your physician or physiotherapist then you should definitely go for the therapy as it has some proven result of short term relief and that truly help to the people suffering from severe back pain or other spinal disease. Though it does not cure the problem but definitely has instant pain relief. The therapy should be carried out as per the doctor’s recommendation regarding the duration and rotation. In starting 1-2 minutes are recommended for per session. Advance therapy time will be depending upon your comfort level but that to with the advice of medical person. The Teeter Inversion model is best for home use and does not cost much. The base model of teeter inversion table cost around $300. You can buy it from local store or online as well. If you order from manufacturer’s website then shipping charges may not be applied. Again it is always recommended to have clear medical report before using the inversion table and one should avoid using it if have the conditions like Heart disease, high blood pressure, fracture, osteoporosis, or hernia etc.